So anyway, as I said, the last one was a toughie, but I believe that it is something more and more people will discover in the not too distant future. There are a few cities in Israel that are truly transforming by leaps and bounds. One of the most dramatic transformations is what is happening in Beersheva, the so-called “Capital of the Negev.” When I was there with a group of tourguides in January, most were so blown away by how much the city has changed in such a short time. I can’t wait to see what it is like in another 10 years’ time. 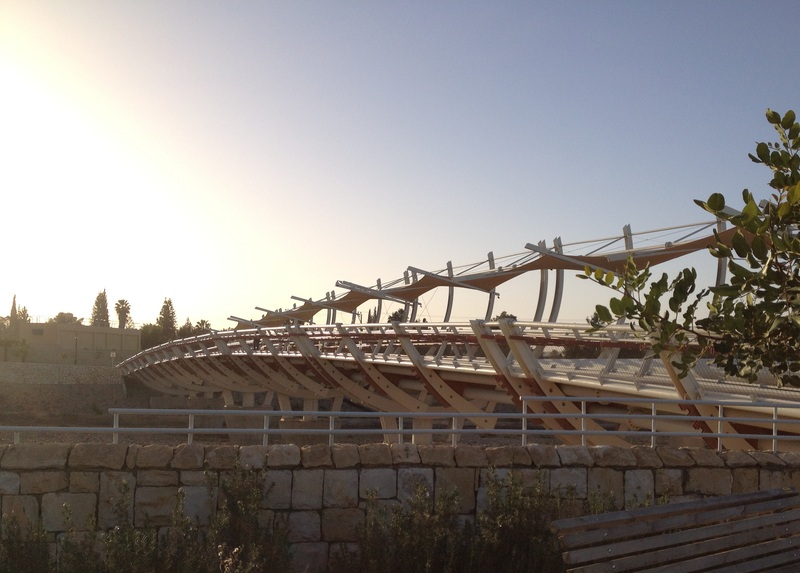 One of the major projects that is under way is a new park in the southeastern side of the city: Park Nahal Beersheva (Be’er Sheva River Park). In brief, it is taking what once was a polluted eyesore and turning it into a beautiful recreation area and desert oasis. The nahal (a seasonal river bed) used to be a dumping ground for old cars and contained little more than a trickle of waste water. Now it is in the midst of a change into a clean and scenic riverbed that will have water all year around, and which will be bounded on both sides by parkland full of greenery, recreation areas and historic sites. One of the key aspects of the park has to do with connecting both sides of the river. The riverbed is actually quite wide and deep, even though it currently only fills up a few days a year when there are flash floods. Thus, the neighborhood on the southern side of the river was cut off from the rest of the city, and became an undesirable place to live. What you saw in the last mystery photo is aiming to rectify that situation. As Tamir correctly commented, the picture was of the Pipes Bridge that stretches across the riverbed. (Sorry Ilana, you were incorrect this time, but I always appreciate your guesses!) There were already some pipes spanning the riverbed, bringing fresh water to the city of Beersheva. The decision was to place a bridge in the same spot, connecting the now-being-renovated Old City on the north side with a brand new park on the south side. An architectural competition was held, and the winning design incorporated the exposed pipes into the center of the bridge, rather than hiding them from view as other concepts did. It is now a simple but beautiful crossing for pedestrians and cyclists. 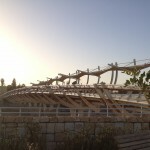 The park is modeled somewhat after the highly successful HaYarkon Park in northern Tel Aviv, and hopes to transform its city the same way that park did for the coastal metropolis. Among other features of the 5200 dunam (nearly 1300 acre), 8 km long park are miles of promenade and bike paths, a man-made lake (filled with reclaimed and purified wastewater from the city), a 10-12,000 seat amphitheater and many parks including a desert flora botanical garden and about 1000 dunams of trees that have already been planted. There will also be a number of restored historical sites, including the famous Turkish railway bridge and Mizpe Beit Eshel. The latter site dates to 1943, and was one of three important Jewish settlements that led to expanded Jewish presence in the Negev desert. Along with the already restored Gvulot and Revivim, Beit Eshel played an important role in determining that the Negev would be given to Israel in the UN’s 1947 Partition Plan. Next time you come to Israel, please visit Park Nahal Beersheva, along with other developing sites in and around the Capital of the Negev. And then come back in another decade to see if you can still recognize it! This is Meir Dizengoff, Tel Aviv’s first mayor, on his horse outside Independence Hall on Rothschild Boulevard. 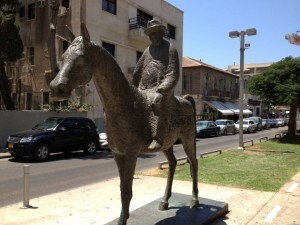 Dizengoff on his horse, ’cause he liked to ride it around town.